Did we manage to find this already? That is wonderful!! I was wondering exactly where ES was!! Nice find! CBS webmonkeys are at it again. So far, nothing on either site. My guess, they've timed the release for three hours after the episode has aired on the East Coast, so I hope to see something around 12:15 a.m. In the meantime, enjoy Bruce Springsteen. Elimination Station is up. Unfortunately, I have to use CBS' player. When it's up on YouTube, I'll replace this. Looks like more conflict between Preston & Jennifer. It's now on YouTube and the CBS insider clips are now up. I thought they would be up three hours after the episode aired on the East Coast. The vids will be up within the hour. As usual, we get some clips from the episode we just saw tonight. In this first clip, the teams leave India and head for Phuket. Here are the teams in Phuket posing with the tiger. Posers. Watch how Mark & Michael gets penalized. Relive the Margie collapse at the mat. Jaime & Cara and Tammy & Victor request less running in the race. Mike & Mel talk to Phil at the mat for the final time. There's a lot of animals at the pit stop. I'm gonna miss them. Great thoughts from Mel. Jen is amused as Kisha fractures the pronunciation of "Phuket". Yes, she says it as if rhyming with "bucket". Jen is carsick in a speeding taxi. Jen tells Kisha she was relieved to see Mel & Mike at the Detour. Mike would like anyone to win, except Jaime. Mike says he and Mel have different goals in the race than the other teams. Those are the insider clips. That's all. The post-race confessionals are next. Tammy & Victor pat themselves on the back for figuring out the gorilla. Mark explains why he's so confident. A recovered Margie says she can't believe how well she and Luke have done so far in the race. Kisha & Jen may fight, but they know when to settle their differences. Maybe if I don't post this next video, we'll see Mel & Mike in the next leg. They won't be in the next leg? Damn. Here's Mel & Mike saying their farewell. That's it for the clips. Kind of short this week. Thank you as always KEN! ..who loves ya babe? Hey! 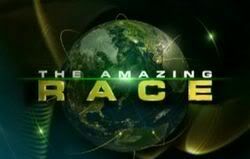 We have an Amazing Race video!!!!! These aren't Insider Clips, but they're better than nothing. And we remember the elephant squatting in Thailand. It's not Elimination Station or deleted scenes, but it's nice to see something at the CBS/YouTube channel. The first videos should be up around 12:40 a.m.
We'll see if there's more conflict at Elimination Station and we we certainly want to see the Insider Clips. After tonight's episode, the deleted scenes should be very interesting to watch. Ok, Insider Clips are up. Let's first relive the episode. As the teams arrive in Bangkok, Margie & Luke and Kisha & Jen foreshadow to next week as they deal with dueling taxi drivers. Road Block! The propeller which Margie and Jaime do quite well. Mark & Michael note that the Reds have retrieved their backpacks. Margie & Luke get first place in this leg. Either first or fourth for them. Kisha & Jen arrive at the mat, but they don't have their travel documents. Mark & Michael are slapped with two, *slap*, two 2 hour penalties. Margie & Luke who have finished first or fourth throughout this race are happy to be back in first this week. Jaime & Cara do their impressions of The Tweedles, Mark & Michael. Actually, they have Mark & Michael down pat. Tammy & Victor are happy to have fought out of last at the Road Block. Jen & Kisha talk about what they learned on this leg. Mark & Michael say they're still in the race and they're not giving up. The producers must not like them all that much as this is the shortest mat chat. Working my way through these and stops to thank KEN! Jaime & Cara find a couple of traveling companions before leaving Phuket. At Phuket Airport, the teams greet a healthier looking Margie. In Bangkok, Kisha & Jen are the sole survivors from the Air France flight out of Los Angeles and could not be happier. Margie is happy to be on the race with Luke. Margie & Luke feel Kisha & Jen are a threat, but they want another team out. Kisha & Jen discuss how the other teams share info with each other. Jen teases Kisha for running around Bangkok without her shoes. Mark & Michael discuss their singing ability. Margie says the race is harder than she thought, but she's having fun. Jaime & Cara get a kick out of Mark & Michael calling them the "Mean Carrot Tops." Victor says he and sister may have their ups and downs, but he feels he and Tammy are working better together since Romania. Kisha & Jen separately discuss what happened with the backpack. Mark & Michael say they can overcome their time penalty at the beginning of the next leg and their Speed Bump. What. Ever. That concludes your insider clips. I don't see Elimination Station. Unfortunately, Elimination Station is up at CBS.com, but not at YouTube. When CBS puts it up, I'll replace the silly CBS video player. Here is Elimination Station. Jennifer and Preston talk about each other to Linda and Steve. Then the eliminated teams go kayaking. ETA - CBS actually hid ES on YouTube. I managed to find it. No more CBS video player silliness! !